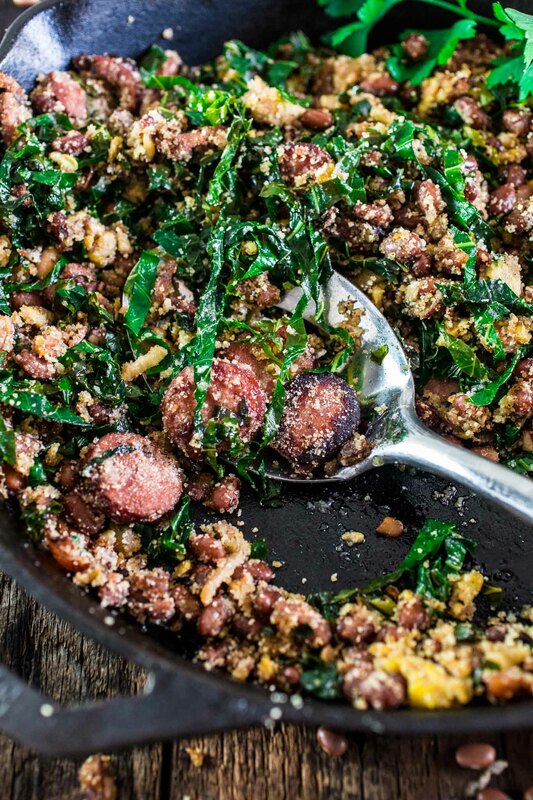 If you like Brazilian food, this one is for you: Feijão Tropeiro. 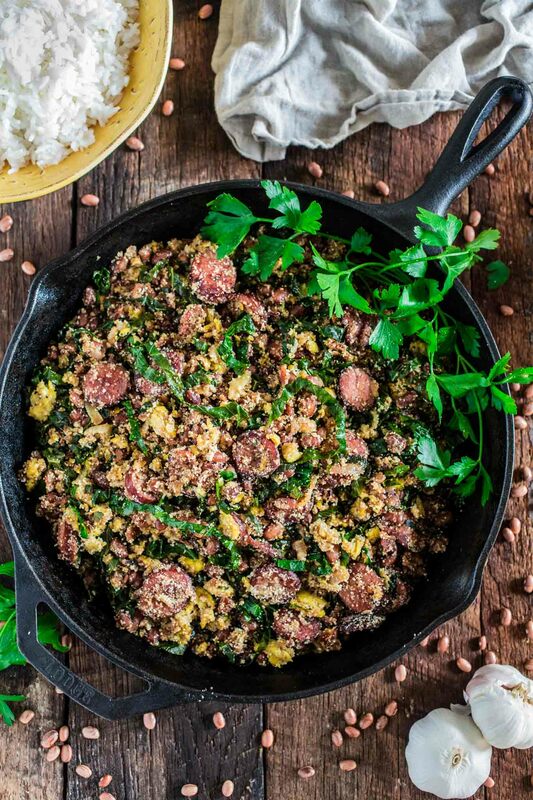 A traditional dish from Minas Gerais, made with beans, bacon, sausage, collard greens, eggs and manioc flour. No wonder this is by far the most requested recipe on this blog to this date. Feijão Tropeiro is really to die for and is the ultimate Brazilian dish. As in, as I was eating it, I felt like I was home! Funny how that works! I am always amazed at this insane power that food has, not only nourishing our bodies but also our souls. There is definitely something special about the act of eating: it can stimulate a wide range of feelings and transport us to all sorts of places! Good food should be able to satisfy your hunger AND your spirit, it should improve your mood and it should connect us to one another. That, right there, is the reason I write this food blog! I celebrate the joy of food and my recipes are the projection of my heart. From me, to you, to your families and friends, to the world. We are all one, connecting from the moment an ingredient leaves the farmer’s hand to making its way onto our forks. This might read a little “hippie”, I know, but it is so true. I guess if you, like me, are living far away from your country, it is easier to understand the solace that only a dish from home can bring. I think that’s why Brazilian restaurants here in the U.S. are so expensive. The ingredients for the food they sell are cheap, but they know Brazilians will come no matter what, because they need that emotional connection from a plate of Brazilian food. Did I scare you already? Are you running for the hills thinking I am completely crazy? Hopefully not. 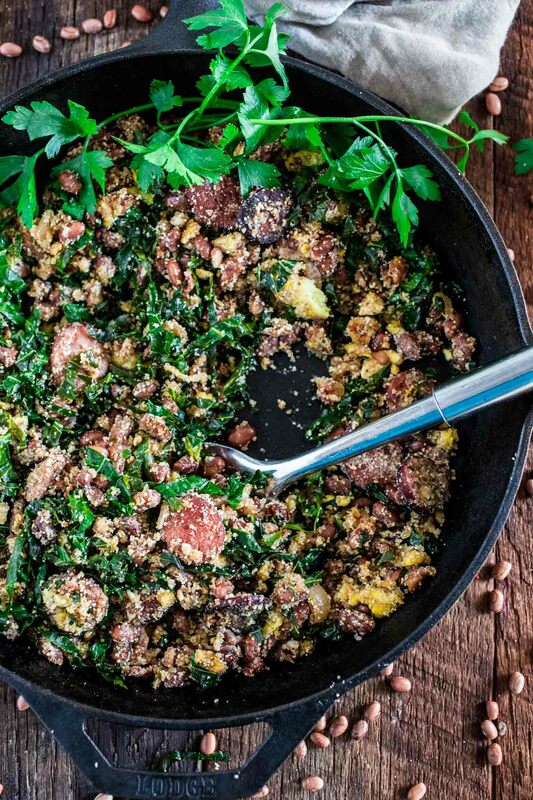 I have a feeling we share the same passion for food and that you are now dying to make this Feijão Tropeiro, to see what could have possibly awoken all of these strong emotions in me. Am I right? ? It’s the simple things in life that are the most extraordinary. 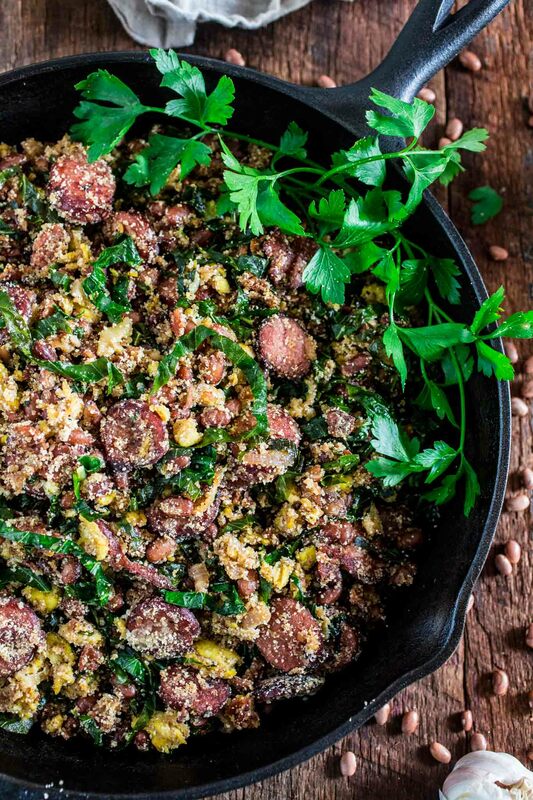 This dish is made from simple, easy to find (in Brazil, but we’ll get to that!) ingredients and is usually made with leftovers. If you don’t usually have leftover beans, that’s okay! Just be prepared to wash lots of dishes. Totally worth it, though! Feijão Tropeiro translates to “Cattleman’s Beans”. I’ll explain: back in Brazil’s colonial times, troops of cattlemen – known as “tropeiros”, in Portuguese – would travel long distances to explore the inland territories of Brazil and transport cattle and commodities. The expeditions were long and could last for months, so they carried certain staple provisions – that didn’t need any refrigeration – along with them, like dried beans, carne seca (salted dried meat) and manioc flour. 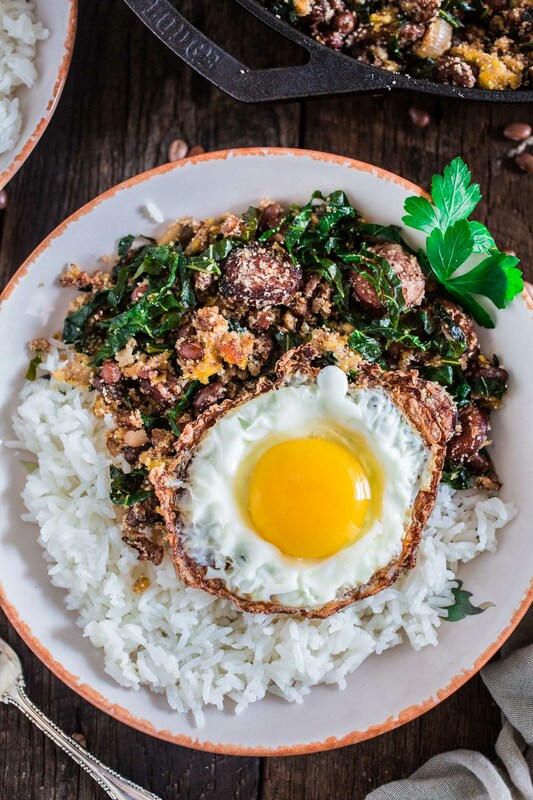 These ingredients were eventually combined into one hearty and filling dish, the Feijão Tropeiro, which since then carries the nickname of the explorers. 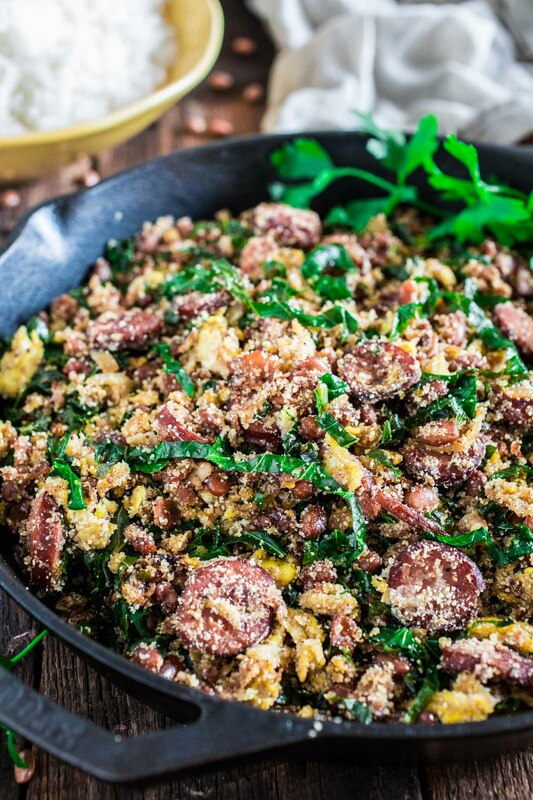 As the dish became popular throughout the country, many cooks have come up with their own interpretations, using different types of beans and meat or adding other ingredients. Everybody’s mother or grandmother makes a delicious Feijão Tropeiro and swear by it. I swear by my version, but feel free to modify according to your likings, so you can swear by YOUR version! I am suggesting substitutes for the ingredients I think you won’t find as easily if you’re not in Brazil. Again, this is a very forgiving dish, so if you can’t get your hands on the right type of beans or sausage, use whatever you can find. Some people say that a Feijão Tropeiro, to be authentic, has to have beans, meat and manioc flour. If you don’t have a Brazilian market near by, you can order Manioc flour through Amazon. If you don’t wanna do that, you can either use coarse corn meal or just omit the flour! It won’t be authentic, but it will still be delicious. Whether you are a Brazilian living far from home, the spouse or significant other of a Brazilian living far from home who wants to cook something nice for your loved one, or just someone who is intrigued to try Feijão Tropeiro, I am 100% sure you will love this! I am really glad you guys asked for this recipe. Keep the requests coming! They keep my creativity flowing and give me ideas of what dishes to share here with you. You don’t have to request only Brazilian dishes. Anything, from any part of the world, is fair game. ? When the beans are done, drain all the water and reserve. Remove the stems of the collard greens leaves. Then, stack a few leaves on top of each other and roll that stack into a cylinder. Using a chef knife, slice the collard greens into thin strips. Repeat with all the leaves. Place the oil in a medium-sized skillet and place it over medium heat. Whisk the eggs in a bowl and add them to the pan. Cook, stirring gently, until they are scrambled. Reserve. Heat 2 tablespoons of olive oil in a large saute pan over medium heat. Add 3 cloves of garlic and cook, stirring often, until golden and fragrant, about 2 minutes. Add the collard greens and cook until withered, about 5 minutes. Season with salt and pepper and reserve. Using that same pan, over medium heat, heat 1 tablespoon of olive oil and brown the sausage until it starts to get crispy, about 5 minutes. Remove from the pan and reserve. Discard the fat. In the same pan, add the bacon and fry until golden brown, about 3 minutes. Then, stir in the onions and remaining garlic, cooking until translucent (about 3 more minutes). Add the drained beans and the sausage and cook for a minute, letting the beans soak up all those amazing flavors. Then, add the eggs and the collard greens, stirring until everything is well combined. Season generoulsy with salt and pepper. Then, add the manioc flour (to taste), a handful at a time, stirring until it is moist and incorporated into the dish. Remove the pan from the heat and sprinkle the parsley and green onions. * In Brazil we soak our beans overnight (cold water), or for at least 30 minutes before cooking (hot water). Then, before cooking, we get rid of that water and use fresh water to cook the beans. This dish looks so wonderful and I love the story about how it got it’s name! Love the background/history of the dish. It looks and sounds fantastic. I also love crispy-edged eggs, no judgement here! You got the yolk PERFECT, too! I’ve never had Brazilian food before, but I need to. This recipe looks amazing – my mouth is watering! This looks so good! I’ve never had Brazilian food before, so I’m anxious to give this a try. I am not very familiar with Brazilian food but this sure looks amazing! I want to dig right in! I ‘m so happy I found your blog! I’m Brazilian and I live in Texas. Your recipes already adapted to the ingredients we can find here is a dream coming true! Thank You so much! So glad you enjoyed it! Thanks, Ronald. I made this dish for a group of Brazilians in Canada and they were SO impressed! I used black turtle beans and substituted carne seca for the bacon. A LOT of dishes but well worth the effort! I served it with crispy fried pig’s ears. I was surprised at the Canadians willingness to eat them and they were a hit too! I’m so glad to hear, Rachael! It’s one of my favorite dishes. I made this last night (my first time making feijao tropeiro) and it was AWESOME!!! I cut it in half because we were doing a long day of churrasco. 1/2 a recipe fed 8 as a side dish, with enough leftovers for my husband to enjoy for breakfast and lunch. I admit it…I used canned beans! For 1/2 a recipe, 1 30oz can of Pinto Beans (drained, rinsed) was plenty. If I made the full recipe, I would use 2 30oz cans Pinto Beans. I also made it about 4 hours before serving and left it covered on the counter. I did everything except add in the farofa (I did stir in parsley and green onions when I made it ahead) – when it was time to serve, I rewarmed it, covered, on the stove. Then I stirred in the farofa, topped with additional green onions & parsley, and added lots of torresmos. We served with grilled meats, rice, and vinagrete (and Brazilian hot sauce, which I put on everything!). So glad you guys loved it! It’s one of my favorite recipes on the blog. :) I like the idea of adding torresmos. Did you make your own? Wow…it only took me 6 months to answer your question…I’m so sorry about that! I do not make my own torresmos. Here in Columbus, we have Mexican markets that sell them. They’re called ‘Chicharrones’ and they’re amazing! I’ve since been back to Brazil yet again. 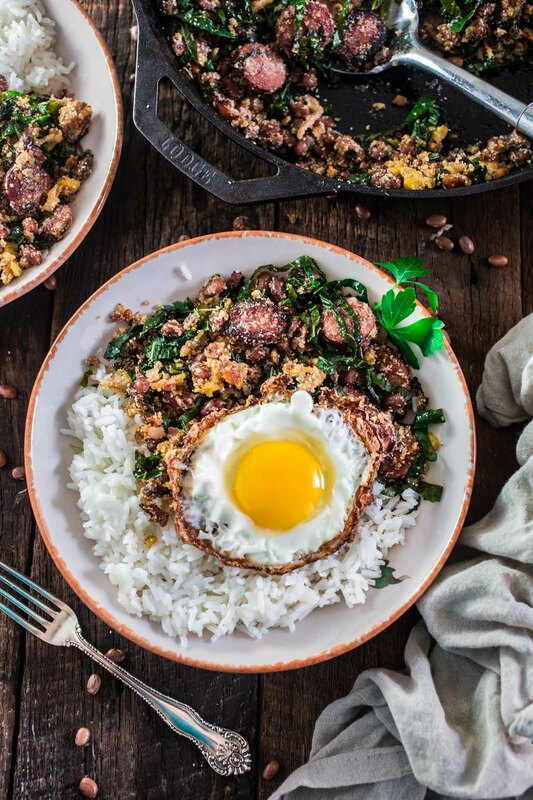 We are hosting a dinner party next weekend with some friends (one who goes to Brazil often for business) and I will be making your fabulous feijao tropeiro recipe for them. Let me know if there’s anything else you think I should make?? I was thinking mandioca frita, pao de queijo (I use a blender recipe too! ), feijao tropeiro, rice, caipirhinas (duh…), and then I think my husband will make bife. But if you have additional suggestions I would love to hear them.